Welcome to WCCUSD Board of Education’s April 27th Meeting! 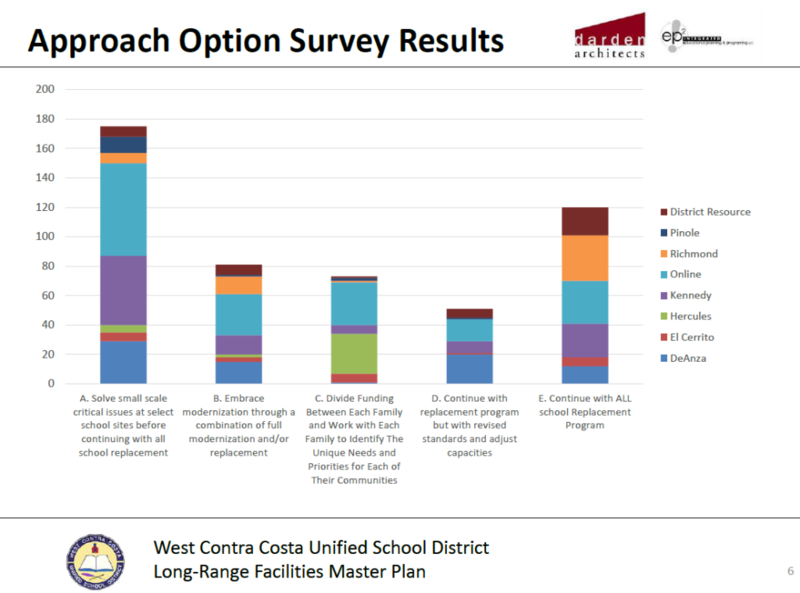 At this week’s meeting, the West Contra Costa Unified Board of Education was presented with a set of recommendations for the Facilities Master Plan Program Approach. Countless community members attended this meeting to share their perspectives with our board members on how our schools should be prioritized. Click here to engage with the full meeting agenda. Representatives from Darden Architects presented the Facilities Subcommittee’s Program Approach recommendation for the Facilities Master Plan. The recommendation was provided to the Board based on months of site evaluation, school site council workshops/input, discussions by the Prioritization Committee and Facilities Subcommittee, in addition to input from our community through meetings and a survey. 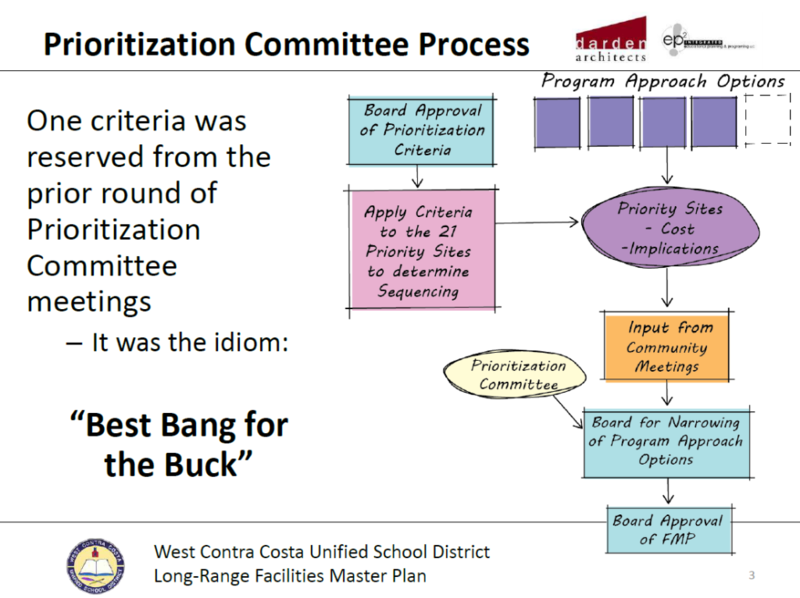 See the slide below for an overview of the prioritization process. 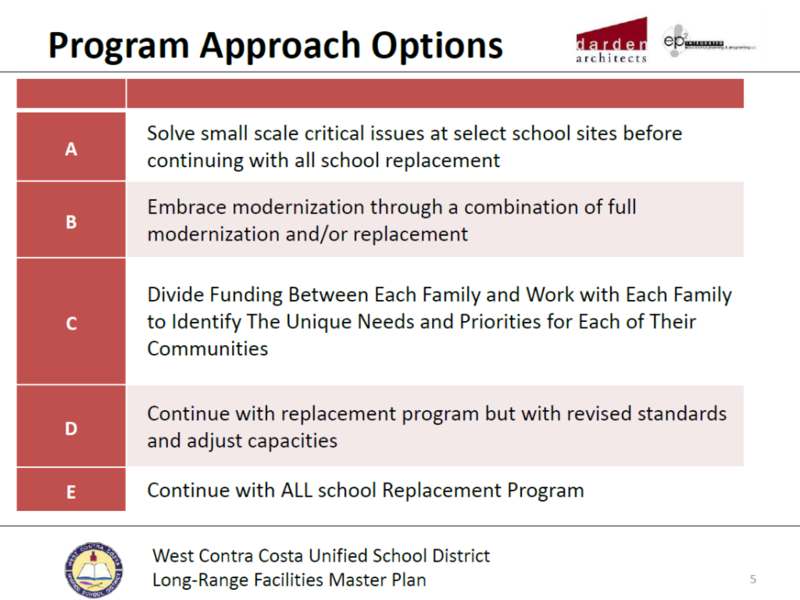 RECOMMENDATION: Of the four Program Approach options displayed below, the Board was recommended Option A — to solve small-scale critical issues at certain school sites, with adjustments made to align with our community and Prioritization Committee’s input. The approach also recommends that after solving these critical issues at select schools, the Board should “embrace modernization” (full modernization and/or replacement projects) at all WCCUSD schools. See below for our community’s input on the Program Approach options. Board Member Madeline Kronenberg moved to amend the Facilities Master Plan Program Approach by further discussing/reviewing alternatives for proposed projects at Cameron School and Fairmont Elementary School. (Cameron School would have been relocated to a larger site in San Pablo, and Fairmont would have been moved to the former temporary Korematsu Middle School campus.) The Board also amended the Facilities Master Plan to call for Valley View Elementary’s old campus in Richmond to be demolished. (Valley View has been in a temporary portable classroom campus for two months.) Board Member Val Cuevas seconded Kronenberg’s amendment. In a 3-2 vote, the amended Facilities Master Plan was approved. Board President Randy Enos voted yes, while Liz Block and Todd Groves voted no. WHAT’S NEXT? 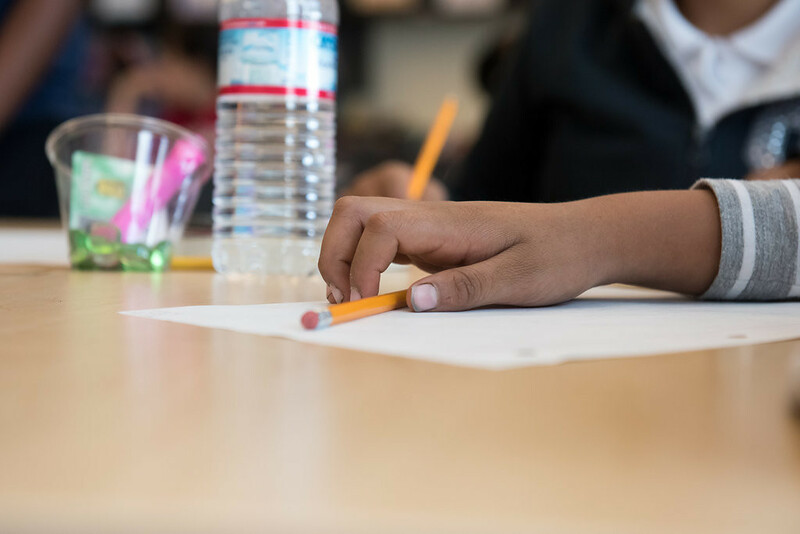 The Implementation Plan — covering schedule, funding availability, costs, and priority — will be developed, and Final Master Plan document will be reviewed for approval by the Facilities Subcommittee on Tuesday, May 17, and our WCCUSD Board of Education on Wednesday, May 25. Click here to view the full Facilities Master Plan Program Approach recommendation presentation from Darden Architects.